Food tastes better when it is cooked in a clay pot, everyone agrees. While today enamel and aluminum cookware is found in most kitchens, many cooks still have a clay pot or two for their special dish. 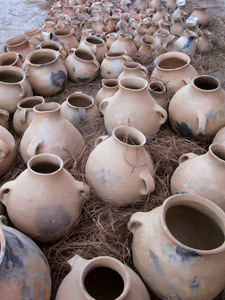 Before synthetic materials were available, clay pots, in many shapes and sizes, were the only option. Pottery has a long tradition in Guatemala, and hand-molding over old clay vessels or gourds was common, with the gourd burning away during firing. The method of coiling was used during pre-Columbian times, and more recently potters wheels have been used to create perfect artifacts. 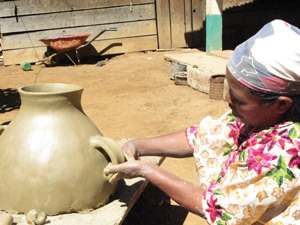 Pottery is made and sold in markets around the country, and San Cristóbal Totonicapán, San Luis Jilotepeque, Santa Apolonia, Antigua and Chinautla are a few places known for this craft. 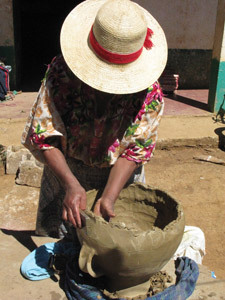 In lesser-known locations clay is also formed into pots, and one such place is the village of Antigua Tutuapa, Concepción Tutuapa, San Marcos. 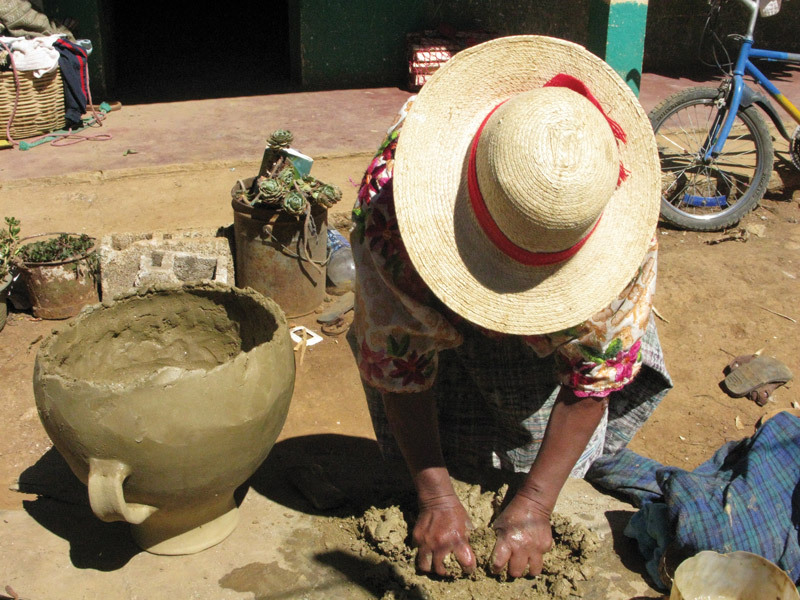 Here Maya women craft clay into beautiful pots using only their hands and basic tools. First, the materials must be obtained and prepared. Since they do not exist in Tutuapa, this entails an all-day journey to nearby San Miguel Ixtahaucán where the clay and sand mines exist. Clumps of clay and loose sand are removed from the ground, loaded into sacks and carried home by mule. The clay is dried in the sun for a few days and then ground into powder by hand. This powder is blended with sand and water until the desired consistency is achieved. A ball is formed, and from this, the inside is pushed out by the potter’s hands to form a thick ring. The ring is shaped until the correct wall thickness and form are achieved. Using only a small flat piece of wood, a short dowel and a bottle cap, the artisan smoothes out the sides of the pot and continues until the upper half of the pot is complete, taking about an hour. Handles are attached to the sides and then, with a damp towel wrapped around the bottom, it is left to dry overnight. The following day, the form is turned upside-down, and work begins on the bottom of the pot. The bottom half is made with experienced hands smoothing large coils to the upper half, until the bottom is closed, about 40 minutes later. Sometimes simple designs are painted on the outside, indents placed around the rim or a slip, or coating, of red clay is applied. When complete the pots are dried for a few days and then fired for an hour in an open fire, after which they are ready for market. Transporting the fragile pots from maker to market is accomplished by careful arrangement in cargo nets with pine-needle padding, to be carried by mule or person to the selling site. Buyers choose from many sizes and forms, depending on need. The common styles in Tutuapa are jarros, small pots with a single handle and a narrow mouth, used for liquids, and ollas, large pots with two handles, which come in handy for simmering beans or tamales. Before cooking with clay pots many people like to cure them by rubbing a mixture of water and masa (cornmeal) or water and cal (hydrogenated limestone) inside. This makes the pot waterproof and ready for the stove, where beans, soup or tamales flavors are at their best, when cooked in a clay pot. Very interested in purchasing a large clay pot for purchase and sent to Maui. Please advise on my options. This will be for cooking. Please advise. I am doing a handbook for docents at the Houston Museum of Natural Science. I am wondering if you have a source of information on prehistoric Mayan pottery. I am interested in the types of clay used and firing techniques before the Spanish. Hi, I wrote this article. These pots are very difficult to transport as they are fired in an open fire (pre-Spanish) and very delicate. Lois, I can send you photos of pots being fired if your are interested. As for the type of clay I do not know. I am sure there is information somewhere on that. Most of my research is on textiles. Kathy, thank you for your information. I read the piece and learned two new processes. Two new pieces of information can be added to our handbook: the use of cargo nets and pine needles to safeguard their pots as well as curing with cal and masa. So cool! I would love to use some of your photos, what ever you are willing to share would be great. Few of our docents have fired pots so they have only a vague idea of what is happening. I am particularly interested in the various ways the potters contrived to turn the pots while forming them, I have read about the use of platforms and corn meal?? (some sort of grainy substance placed on a surface and and topped with a piece of rubber to add in the turning). I seem to remember a potter in Oaxaca in the 60’s using two plates, bottom one upside down and second right side up so they would spin off each other – can you verify that for me or is it a figment of my memory? Hope all is well with you, and if you get to Houston please let me know. I am happy to share photos, of which I have many of the entire process. I think they may be on my old computer…I will check. Where should I send them? As for the Oaxaca potter, I will ask a Oaxacan colleague who probably knows for sure.